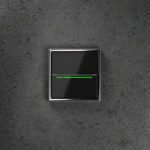 The JUNG Corridor Unit enables quick and easy communication between hotel guests and personnel. With coloured back lighting ‘Do not disturb’ or ‘Make up room’ can be displayed within the switch rocker, just as the guests require. Both visitors and personnel request entry through a single button. Card readers can also be integrated in the JUNG system. The corridor unit is now newly available in a high-value glass version as well as in plastic switch variations. The glass versions have a discrete yet stylish effect, with the symbols only displayed after switching – and not visible in ‘rest mode’. Standardisation lends itself whenever there is repetition in the room design in building projects – in hotels, for example, or other functional buildings. This also works with electrical installations made possible with Plug & Go, a new prefabricated installation system jointly supplied by JUNG and Wieland for lightweight walls, furniture or wall linings and shown to the public for the first time at the Light + Building fair. 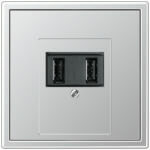 JUNG equips hollow wall sockets with various components and wires them up. 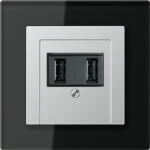 Wieland then supplies the appropriate plugs, distributors and power cables for the basic installation. Everything is prepared in such a way that the fitter only has to plug the system together on site, and no longer has to use screws. All components are industrially prefabricated and 100% checked. This plugability reduces installation times by up to 70 per cent while the mechanical and colour coding cuts down the frequency of errors. 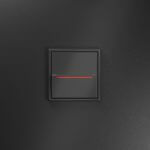 The new hotel card switch with RFID reader recognises the room card and displays the status through an RGB fibre optic cable. Together with its cooperation partner, ASSA ABLOY, JUNG also introduced an intelligent version of its energy-saving switch as part of the 2018 Light + Building fair. The portfolio is rounded off with three intuitively operated fan-coil room temperature controllers for hotel rooms. It is now possible to realise fan-coil facilities with systems for 2-tube, 4-tube or also building system technology in the JUNG design. 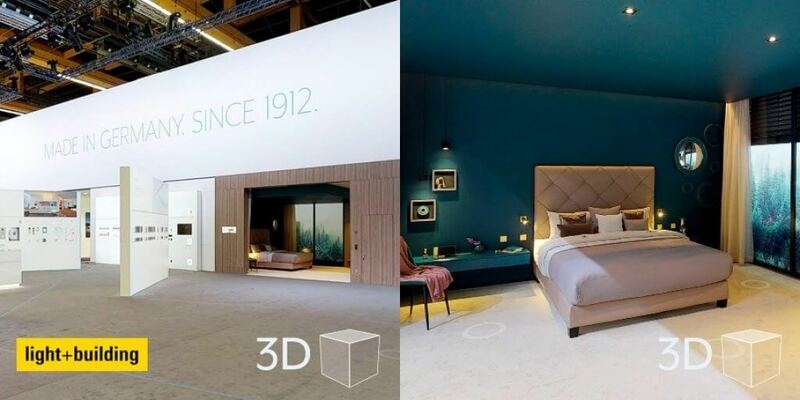 The Jung Hotel room accessible in 3D, which was premièred at the 2018 Light + Building trade fair, is now on a world tour. As part of the 2018 Bau China Congress (31.10. – 03.11.) JUNG will once more be showing its premium-equipped hotel room in operation. An access control first takes place before you can get into the hotel room (in cooperation with ASSA ABLOY). On entering the room, a bed from Treca and bedclothes, pillows and materials from the Luiz home textile workshop, carpets from the ANKER company and wallpapers from Arte give you a feel-good moment. A shower from Dornbracht, an OLED television from Loewe and a Revox audio unit complete the premium facilities. Further special features are the motorised curtain from Silent Gliss that can easily be opened and closed at the touch of a button and the internal telephone station from Siedle fitted with a touch display and operable via KNX. The prefabricated Plug & Go installation system introduced in cooperation with Wiegand is also put to use here. The voice control presented by JUNG under the “Smart Hotel” name is especially convenient, particularly for hotel rooms without barriers, with display view through Echo Show from Amazon. This makes the functions of the room operable by voice command through the Alexa voice system. The guest sees the possible voice commands in the display. These draw on the JUNG Visu Pro software when activated. The desired functions in the room are then triggered through the KNX system. The ideal room temperature depends a great deal on individual perception. Well-being and contentment only come about from a comfortable temperature that can be exactly controlled. In addition, flexible control of heating, ventilation, and cooling also provides a healthy indoor climate and greater energy-efficiency.